A Glimpse of the good life along the Cote d’Azur. There are many ways to leave the Monaco Yacht Show: by car, by train, by helicopter. 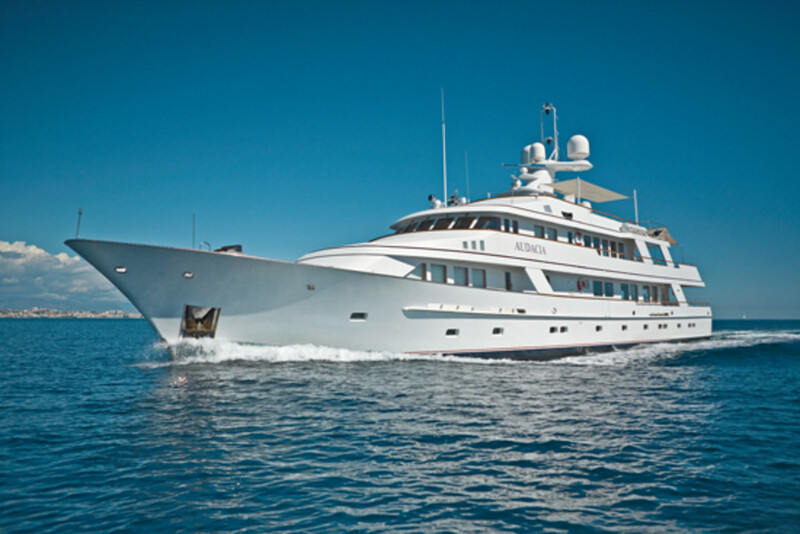 But for the lucky few who have an invitation, there is only one way: by megayacht. 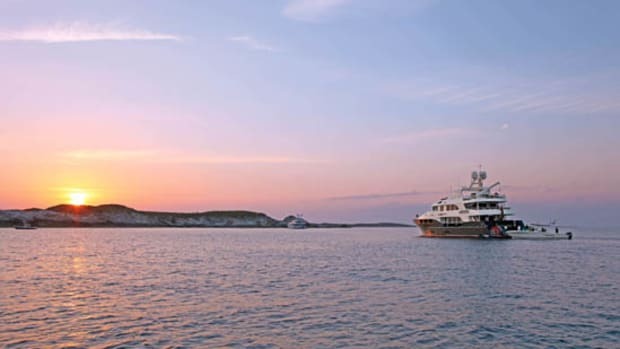 Fortunately, I had one—to spend four days and three nights aboard Audacia. It was an invitation that garnered jealousy from friends, family, and even coworkers. 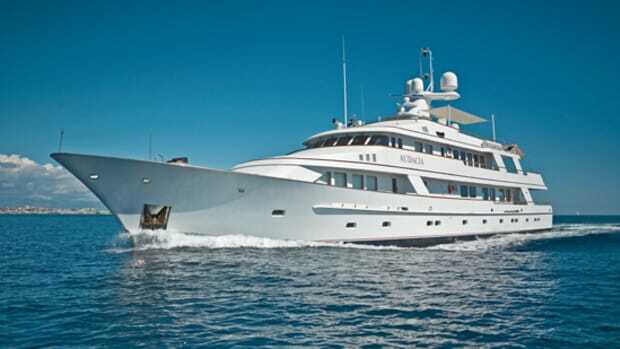 At 152 feet Audacia was far from the largest yacht at Monaco, but she came with a storied pedigree. 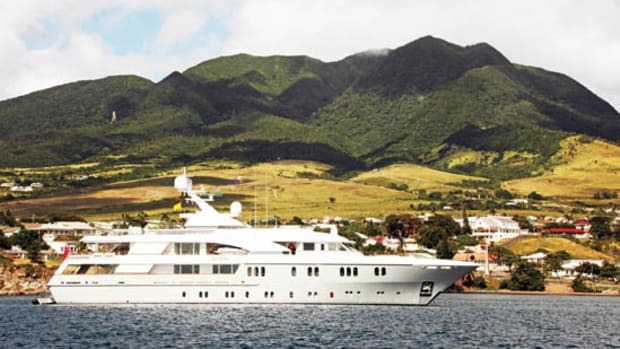 She was built by Feadship’s Royal Van Lent shipyard in 1987. 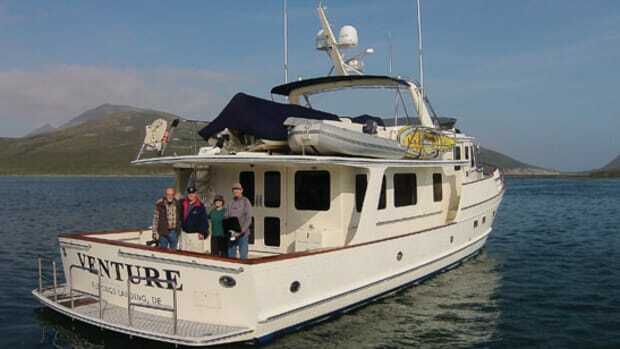 Her current owners bought her in 2007 and gave her a complete interior refit. 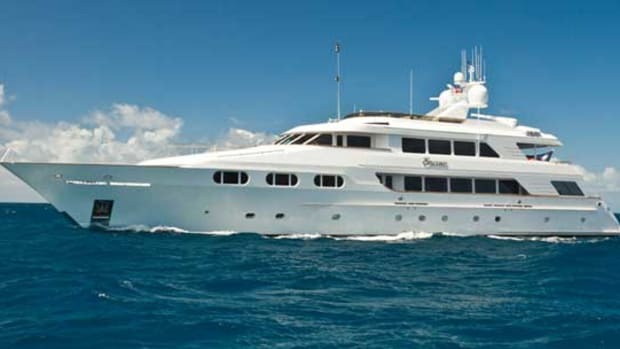 Interior designer Joanne de Guardiola restyled her interior in comfortable blue and white throughout, from the cabins (the master suite forward, a full-beam VIP, and four aft guest cabins) to her saloon and skylounge. But before I boarded I had to plan, and while planning I learned that though watersports and leisure activities dominate in the Caribbean, in the Med it’s all about exploring ashore. So my four-day itinerary filled up fast with the small cities of the French Riviera: Antibes, Saint-Tropez, Cannes, and Nice. Being in Monaco for the yacht show was a flurry of activity, but the moment I boarded Audacia, everything became much calmer—though I can’t say whether that was because of the gentle rocking of the boat or the instant attention from the crew. After unpacking and settling into the VIP cabin—and adjusting to the thought that, for a few days at least, I’d be a VIP—it was time for hors d’oeuvres in the main saloon, which consisted of a seemingly endless variety of canaps. Dinner followed on the skylounge, beginning with a bruschetta of prosciutto, roasted figs, and gorgonzola topped with 18-year-old balsamic vinegar, followed by a Thai green curry of monkfish, and finishing with a Belgium crpe with bananas all prepared by the yacht’s chef, Jimmy Rutherford. I would have licked my plate—had I not had too many hors d’oeuvres. The trip was off to a fantastic start even before we got underway after dinner for Antibes. Breakfast was no less impressive. Though the daily continental breakfast of local fruits as well as fresh-baked croissants and pain au chocolat would have been more than enough, a hot breakfast was also available. We were usually underway during breakfast, so I had my coffee with a changing coastline as a backdrop. And the obsessive attention to detail extended beyond the kitchen. My toilet paper was always folded into a neat point, any clothing I’d left on the bed was always carefully folded, and every evening, a golf ball-size Suchard chocolate waited on my pillow.